After the iPhone application, Shareprice has released another version for Google Android. The new application is available in the Android Market for users of the T-Mobile G1 phone. 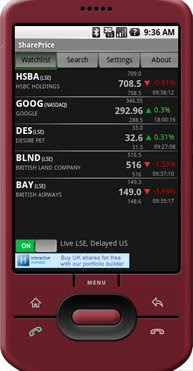 It streams real-time tick-by-tick price movements from the London Stock Exchange, using Lightstreamer as the push engine. More information is available from the Shareprice site.